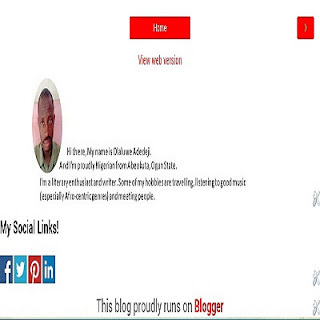 Blogger is a Google plus centric platform for publishers and comes completely free. And by default, it links to your Google plus account/profile and rendered in the footer area of the index page of your blog. Not many publishers liked this, but they’re limited in terms of customization options available to them. While many as well care little. In spite of these, a lot of bloggers/publishers have achieved remarkable successes with their blog customization. Recently a gap was created when Google shut down it social media platform, Google plus. Alternatively, the option of Blogger draft to display publisher’s full profile was dangle before publishers which many have taken and many others not. Before now, I for one have always had issue with the limited Google plus profile and I’ve made bold attempt at it customization by adding a bit of personalized string right after the Google plus profile in the template. After a lot of disappointing efforts to customize the about page by the way of tweaking the template, finally I was able to achieve it which is what I’m about to share with you here. But first, for this method to work, you need to switch your theme to custom. if you're on any of the new blogger themes you don't need to worry. Now let’s get down to the basics. To add a custom about page, you need to create a portable pictured banner with a clear, simple and brief about information. After that, head directly to the publisher dashboard, hit on new post button and upload the logo like you’ve below. Now, close the page and head to layout page. Click on add a gadget button anywhere and scroll down to HTML option and click it. Paste the code in the open field and save. By default, the code is align left which is perfect. if you wish, you can align it center by changing the left in the <div> string of the first row. Drag the new gadget most certainly to the footer area and save the new arrangement. The next step is to head to the blog template and click edit template. Search in the template field for the HTML string that controls the new gadget. Right after the string locked=’false’, add the string mobile=’yes’ and hit save theme at the top left section of the template task bar. Check your mobile/desktop views to see the new gadget working. *Note: The most interesting aspect of this widget is that it has the capacity to behave like a standalone page when you click on it and returns to previous position when click again.